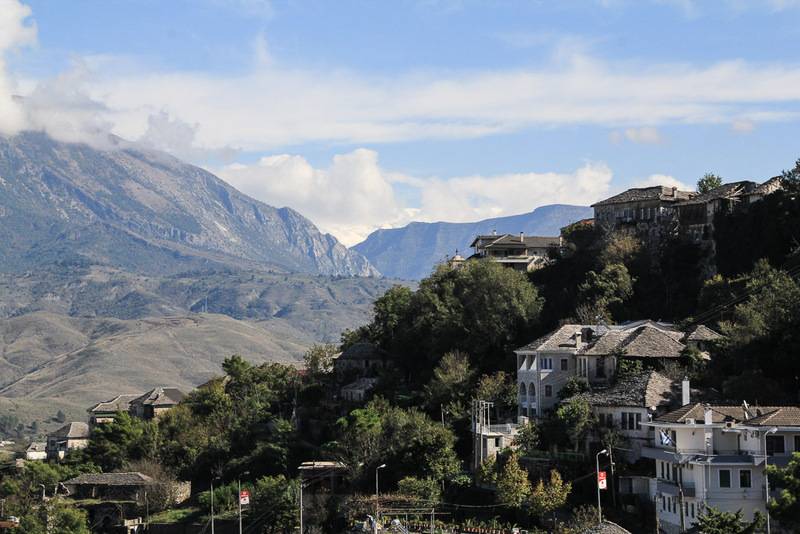 Albania – castles, crashed planes and drug lord villages. Albania is a strange creature, it is very different to a lot of the countries we have visited so far in a variety of ways. On of which is their petrol stations. In most countries, petrol stations are a good bet for a little shop where you can pick up a cold drink and a chocolate bar. 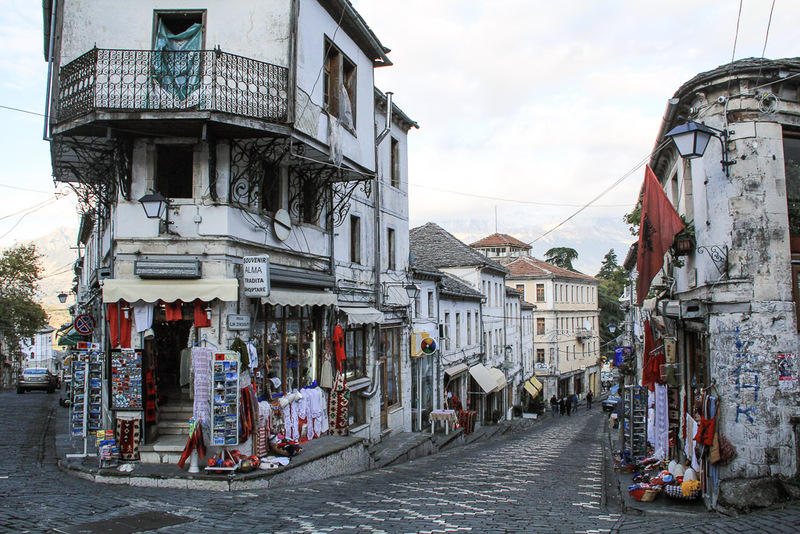 But in Albania, they are often coffee shops, hotels or even bars. Usually this is a little disheartening for us but yesterday it worked to our advantage and we are staying in a hotel over a petrol station with lovely rooms, cheap rates and best of all, a bustling little coffee bar downstairs! This little hotel is in stark contrast to the hotel that we woke up in in Fier yesterday. A smell of petrol permeated everything, our clothes, the bed and the hallways. The black slick of a river snaking around the back of the hotel looked even more grim in the bright light of morning and we were eager to get out of there after we’d had some breakfast. The usual fare of burek and coffee saw us ready to head south towards the mountains and we battled through the traffic out of town onto the busy road that brings locals and tourists alike to the ever popular beaches along the Adriatic Sea. We prayed that the road we would be taking towards the hills would be quieter and our prayers were answered. We were surrounded by wide plains rolling gently into hills which, as we cycled along, gradually transformed into mountains rearing up to the east with glimpses of snow capped peaks. Our day was uneventful and despite aiming to cycle 120km all the way to Gjirokaster, when we had reached the outskirts of Teppelene, we were both ready to stop for the night. The petrol station hotel did not smell of petrol and at 12 euro for a spotless, comfortable room was a bargain. We locked our bikes to a petrol pump (not because we are weird, but because we were told to) and settled down with a beer in the downstairs coffee bar. Dinner of chorizo and chickpea stew went down a treat and we slept like babies. 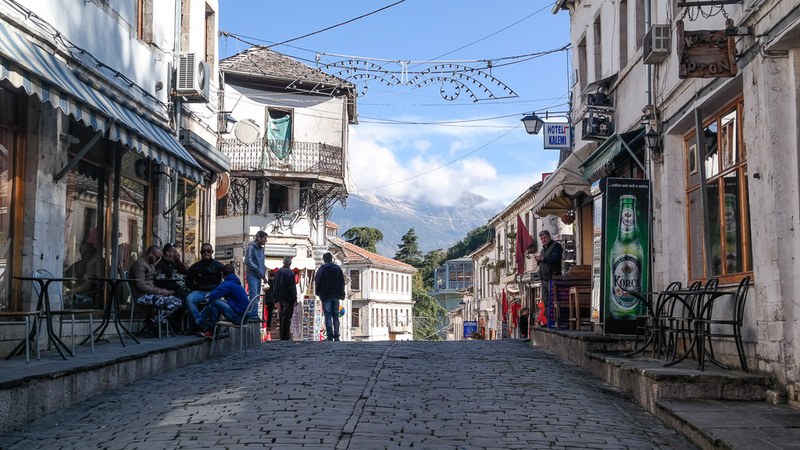 Today we decided that we would take a Furgon to Gjirokaster to check out the castle there and the UNESCO site that is it’s rambling, old cobbled streets. We waited a while beside the petrol hotel with no sign of anyone and so we began walking up to the village centre hoping that we would pick one up there. As we crested the hill and the village came into view, a minivan zipped around the corner so we waved it down and before we knew it, we were on our way! Our furgon dumped us unceremoniously in the new part of the city, the old city and castle towered above us so we prepared ourselves for the stroll up the street cobbled streets with a quick coffee (there’s always time for coffee!). The city transformed in the blink of an eye as we ascended the cobbled alleyways from a conglomeration of ugly concrete blocks into warrens of tiny streets surrounded by houses and shops dating back to the 18th and 19th centuries. 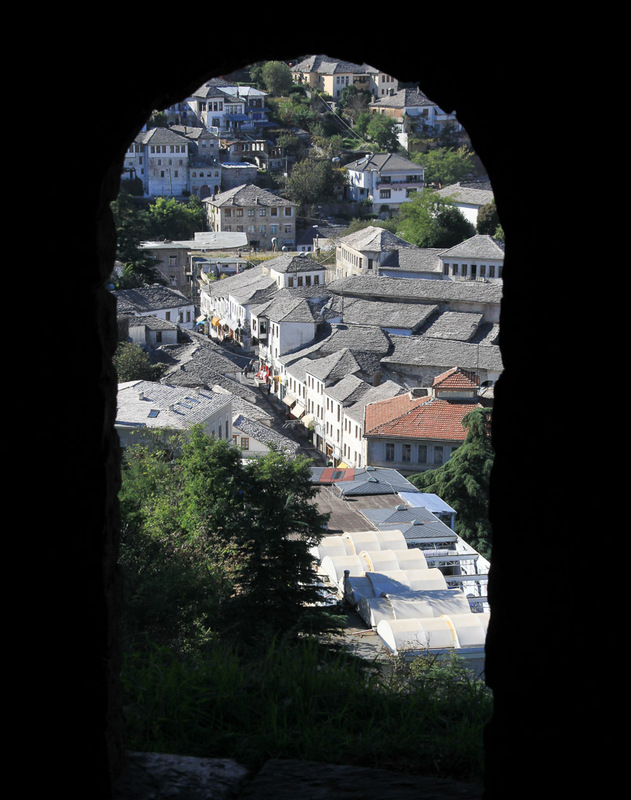 Gjirokaster is considered by the folks at UNESCO to be a “rare example of a well-preserved Ottoman town built by farmers of large estates.” And they are beautiful. The streets often slope downhill given breathtaking views of the snow capped peaks in the distance. After the usual burek stop, we headed up more windey cobbled streets to the castle itself. 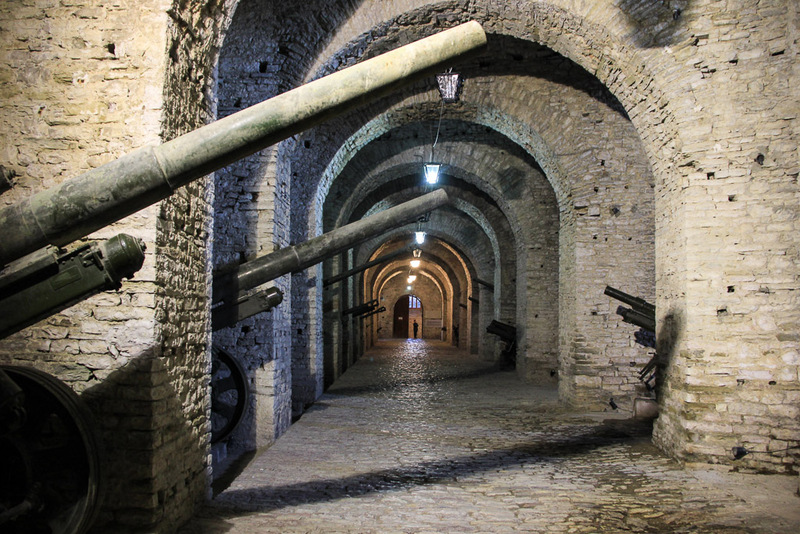 The citadel dates from the 12th century with various extensions and renovations carried out throughout the ages. After paying a policeman 200 Lek at the entrance, we headed in to look around. The main gallery as you enter the ground houses German and French field guns mainly from World War II. If Sam was writing his post, no doubt he would have some nuggets of wisdom about all this artillery, however, you’re stuck with me and as far as I’m concerned, they were big, old and scary. As we exited the gallery, blinking in the bright, blinding sunshine, we spotted another piece of military equipment, a captured US Air Force plane. (sorry, it wasn’t captured! 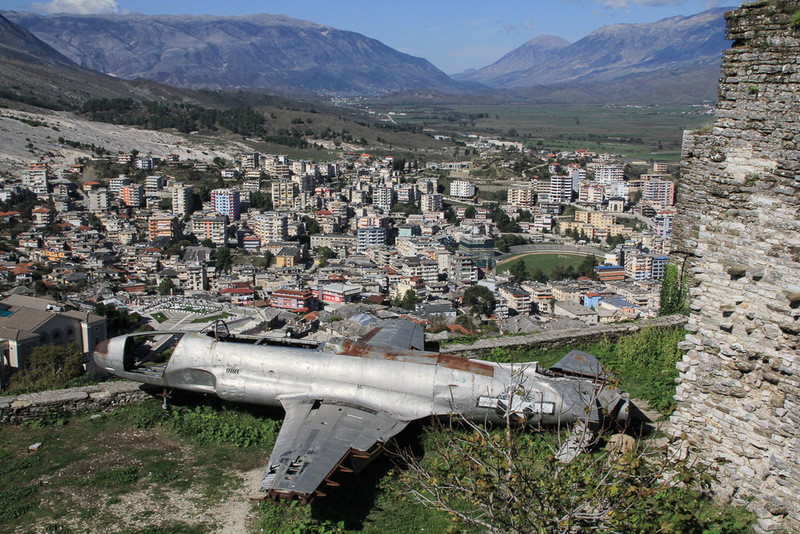 It developed engine troubles and made an emergency landing in Albania, the government of course told everyone they had captured it!) It is on display as a reminder of the Communist Regimes struggle against the western powers of Imperialism! 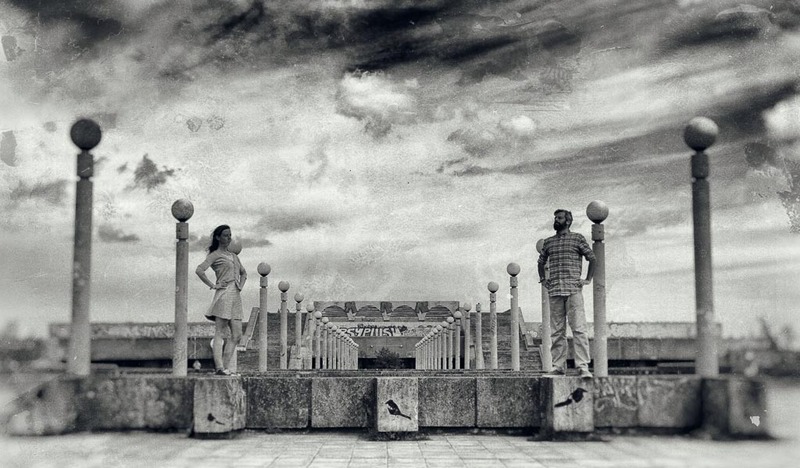 It seemed to be the most popular attraction with men adopting macho poses and women draping themselves across it seductively to have their photos taken. We wandered further on to see what else the castle held. A beautiful church stands at the eastern edge looking over the town and providing stunning views of the surrounding mountains, and a well cared for staged that plays host to a Folk Festival here makes a pretty centrepiece. Otherwise, the many buildings and fortifications are in pretty bad repair. Nonetheless, we spent an enjoyable few hours scrambling up and down walls and exporing the hidden corners of the castle. It was at this stage that we met Gokben and Nicolas, a couple from Turkey and France respectively who are cycling round the world on two shiny recumbent bikes. They joined us for lunch of qifqi, a local egg and rice dish, and salads and we traded stories of our travels and our plans to come. Time passed quickly before it was time to get a furgon back to Teppelene. We hopped out of the Furgon at the edge of the village so that we could walk through the village before heading back to our hotel. Teppelene is a small but pleasant village and even has it’s own castle. It’s currently being renovated but my initial impression was that it’ll be worth a visit once it’s done. We headed down hill to our petrol palace and are sat chiling out while dinner simmers. Tomorrow we’re heading towards the hills and hopefully some beautiful scenery. 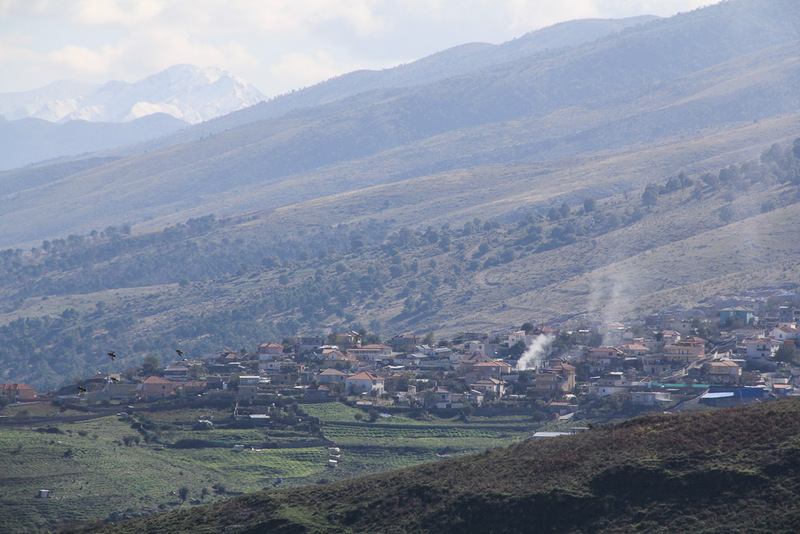 Lazarat – the village with a $4.5 billion drug gang. 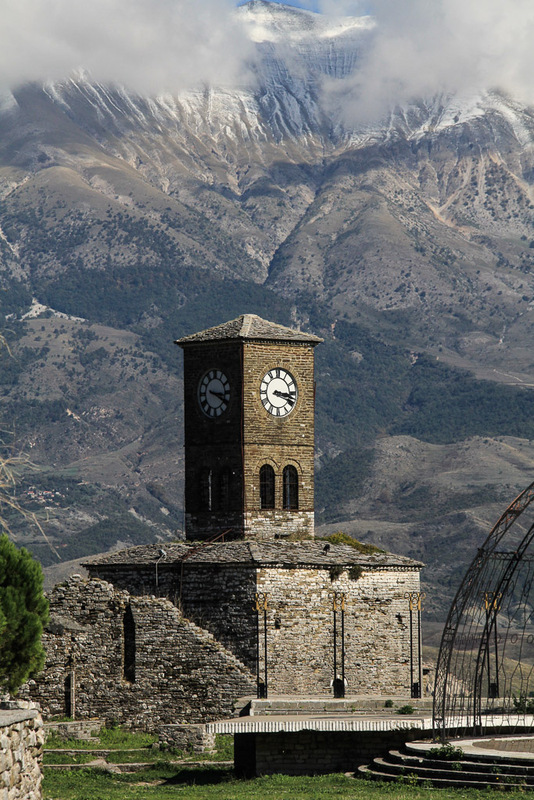 We had to pass many checkpoints along the roads of southern Albania and we were unsure why. It wasn’t until we were looking at the google map in Gjyrocaster that we realised the next village along was Lazarat, a place that has been almost lawless for many years due to its huge production of drugs. We could see it from the castle, its peaceful looking hillside location revealed little about what had been happening there recently. The heavily armed villagers had been fighting with the police earlier in the year as the police had been trying to regain some level of state control over the village. The policeman we stayed with in Durres had been involved and had photos on his Facebook burning huge piles of Marijuana. 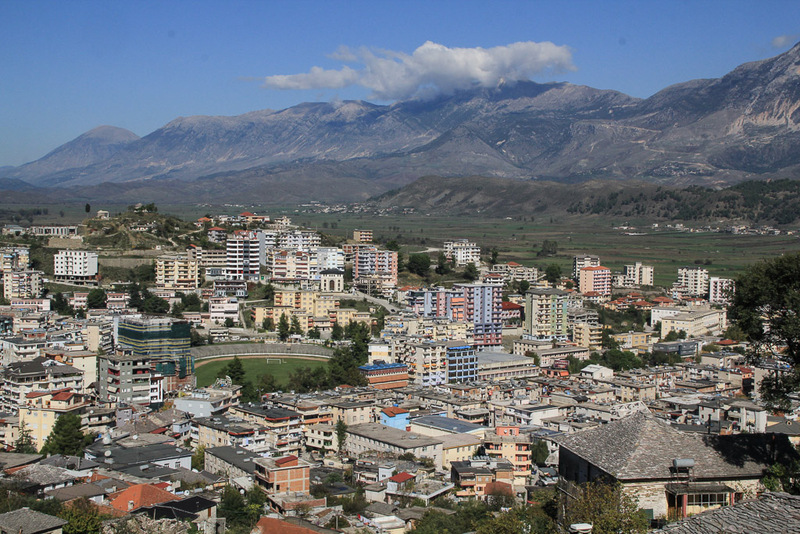 It really is crazy that one small village had been involved in an illegal trade that could have equalled almost half of Albania’s total GDP, more than the wealth generating ability of the capital. Here is an interesting read about Lazarat from Vice. ← Steel of the party!